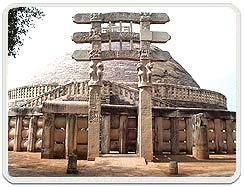 Sanchi has been well-known for the Stupas which were built on the peak of a hill. The purpose of these stupas was mostly religious. The most likely use of the stupas has been said to keep the relics. Some of these stupas have been found containing relics of disciples of Buddha. The stupas date as early as the 3rd century and are built in brick made of stone. Though most of the stupas are in ruins now three remain intact and are of great archaeological value. The designs and the carvings on the walls and gates of these stupas spell a heavenly grace and are very tastefully done. This is one of the oldest stupas in India. 36.5 m in diameter and 16.4 m high with a hemispherical dome this massive structure was constructed by Ashoka in the 3rd century B.C. 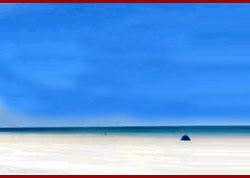 But the whole structure was enlarged later. Today the original brick structure by Ashoka is inside the enlarged stone one. 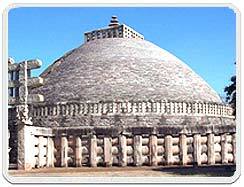 The stupas of Sanchi stand on the top of a hill. There are four entrances to the great stupa. A railing encircles the stupa. The entrance is through the magnificently carved gates or as they call it the Torans. These Torans are one of the finest examples of Buddhist art in India and are best works at Sanchi. The path to the stupa has been smoothen by the centuries of pilgrims visiting the place. Near the stupa stands a Chunar sandstone pillar which has some edicts by Ashoka which warns against the schism within Buddhism. 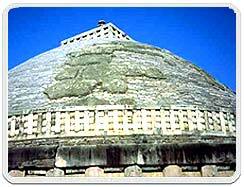 This is second stupa on the Sanchi hill. This again a very good example of the Buddhist architecture. The stupa stands on the very edge of the hill. Though there are no entrance to this stupa, it attracts visitors for the stone balustrade which encircles it. The wall of stupa is decorated with medallions. But the seems to be an imagination of a child as they depict animals, flowers people and scenes from the mythology.